EIP junior environmental science and policy major Jimmy Shue wanted to bring more sustainable produce to the UMD campus through hydroponics, which involves growing plants without soil. 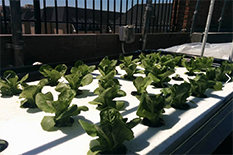 In the spring of 2015, Shue and his team created UMD Hydroponics, securing a $750 mini-grant from the UMD Sustainability Fund to explore the use of hydroponics on campus. A year later, Shue’s organization is now called Green Roots, and has expanded its mission to include Education and Outreach, Research, and Community Service. Green Roots also received recognition this spring from the Student Organization Resource Center as a student group dedicated to all things hydroponics and vertical farming. The club hopes to donate the food it grows to local food banks. They also hope to reach out to public school students in Montgomery and Prince George's counties to teach them about sustainability initiatives. This is the second Sustainability Mini-Grant Shue has won.